HCA Healthcare CEO R. Milton Johnson will step down at the end of 2018 and be replaced by current President and Chief Operating Officer Sam Hazen. The hospital chain's board of directors announced the moves Monday before the markets opened. 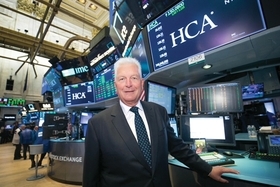 Johnson has led HCA since 2014 and has been with the company for 36 years. In a statement, Johnson noted the investor-owned hospital chain improved patient satisfaction as well as its revenue under his leadership. "I remain excited about the company's future and have strongly endorsed Sam as the right person to lead the company; his leadership has greatly contributed to our success," Johnson said. Hazen has also been with HCA for more than three decades. He became COO in January 2015 and was named president of the hospital chain in November 2016. Hazen is a key architect of a market hub strategy that has positioned Nashville-based HCA as the nation's healthiest investor-owned hospital chain.